A new fully automatic object tracking and segmen- tation framework is proposed. The framework consists of a motion-based bootstrapping algorithm concurrent to a shape-based active contour. The shape-based active contour uses finite shape memory that is automatically and continuously built from both the bootstrap process and the active-contour object tracker. A scheme is proposed to ensure that the finite shape memory is continuously updated but forgets unnecessary information. Two new ways of automatically extracting shape information from image data given a region of interest are also proposed. 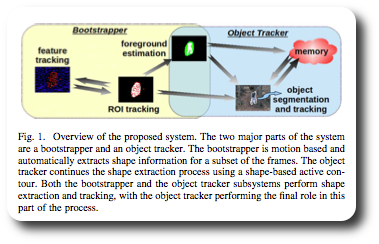 Results demonstrate that the bootstrapping stage provides important motion and shape infor- mation to the object tracker. This information is found to be es- sential for good (fully automatic) initialization of the active contour. Further results also demonstrate convergence properties of the content of the finite shape memory and similar object tracking performance in comparison with an object tracker with unlim- ited shape memory. Tests with an active contour using a fixed- shape prior also demonstrate superior performance for the pro- posed bootstrapped finite-shape-memory framework and similar performance when compared with a recently proposed active con- tour that uses an alternative online learning model. J. Chiverton, X. Xie, and M. Mirmehdi, Automatic Bootstrapping and Tracking of Object Contours, IEEE Transactions on Image Processing (T-IP), volume 21, issue 3, pages 1231 – 1245, March 2012. This entry was posted in Publication and tagged Computer Vision on March 10, 2012 by Xianghua Xie.